Do you have a garden and have been thinking of incorporating a good ole’ compost to the mix? this is such a great idea if you are after a little project to keep you busy and an added bonus is that your garden will thank you with delicious fruit, vegetables and flowers that have been absolutely soaking in all the nutrients from the emptied compost. Compost is simply decomposed organic waste from mainly food scraps. It is nature’s way of creating an added boost to crops and general gardens. All you need to keep feeding your compost is your kitchen food scraps and even garden waste – how easy? in just 2 – 3 months your supply will be at the stages of an ongoing steady fertilizer that’s packed with nutrients for your garden. What type of compost bin is best? A plastic bin in which you can purchase from your local hardware shop is perfect for your smaller compost to scale but if you are wanting a larger to scale bin, go for the wooden ones. You can build a bin yourself from googling a DIY step-by-step guide. You can also just start a heap on the ground but the choice is totally up to you! Where do i place my bin? It is a good idea to place the bin in place away from the house. it will need to be sheltered by intense heat and wind. Once you’ve decided where you’re going to place your compost bin, it’s time to get started with the fun stuff. Add your organic material in layers to create a balance of carbon and nitrogen. grass clippings, anything green and leafy. Adding a product like lime to each layer as you prepare your heap will accelerate the composting and help neutralize acidity, plus it has the added bonus of helping to keep flies away. Keep adding alternate layers, then add water and cover the heap to enable it to decompose quickly. Compost needs to be turned regularly to aerate and help the decomposition process. -Tea and Coffee Bags: If you are wanting to place Tea and coffee grounds into your compost, that is absolutely fine but please make sure you do not put the bags in aswell – these bags generally contain synthetic fibers that do not break down in a compost pile and can contain some iffy chemicals you do not want in your soil. –Citrus Peels & Onions: While fruit and vegetable scraps are the main ingredient to making some fantastic fertilizer there are some food scraps you should steer clear from your compost, these include Orange peels & Onions the reason i place these in bold is because it is such an easy food scrap to slip past you and weasel their way into the compost bin, perhaps placing a sign on the compost bin to remind you not to put them in would be beneficial? Unfortunately, the natural chemicals and acidity in orange peels and onions can kill worms which of course slows the process down as the little worms and other microorganisms actually really con tribute to the outcome of your compost. Plus, unless you take time to cut everything down into smaller pieces – they take longer to decompose which results in a longer wait until you can use your fertilizer. –Meat & Fish: These will of course, decompose fine and have nutrients that would be a good addition to your soil, it will unfortunately attract rodents like Mice, Rats, Cats, Dogs etc who would carelessly ransack your bin to eat them. The smell of decaying meat may annoy you and possibly your neighbors as well! –Coal ash: The ash left from the fireplace should most certainly not be added to your compost pile, it contains quite a significant amount of sulfur as to make the soil excessively acidic, which we can confirm will harm your plants. Wood ash can be added in small amounts but do not add coal ash! –Sawdust from TREATED wood: While untreated, natural wood sawdust can be a great addition to your compost pile. The reason that treated, polished and vanished wood is not a great addition is because the toxic compounds wont be able to break down in the compost process and can negatively affect the microorganism activity and plant health. -Large branches: Large branches and twigs will take forever to decompose which in conclusion will slow down the process, it may be a bit of a pain to lengthen the process by cutting them down to be smaller but it will allow you to use the compost for your garden a lot quicker. The smaller the branches, the quicker the breakdown cycle is. Alternatively, you can start a branch pile at the back of your house where its purely dedicated to branches, twigs etc which will decompose over the course of a couple of years. A branch pile is however, a great habitat for smaller rodents. Always keep your pile damp but not saturated. If you are adding food scraps bury deep in the pile. Do mix your lawn clippings with your food scraps, grass tends to compact which may prevent the air flow through the pile. Ensure you compost gets some sunshine but not too much. As we all know, the kitchen truly is the heart of the home, the place where you make memories and learn skills daily, there is never one whole day you don’t use the kitchen. 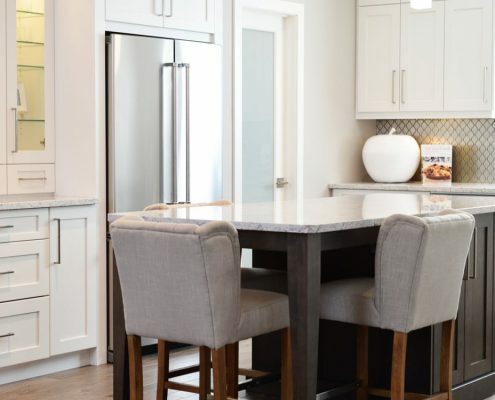 Fortunately, a kitchen isn’t such a hard room to style with all the lovely options and ideas out there – the options truly are endless! When it comes to the kitchen, you want practicality but also a great look that pulls everyone’s attention as soon as they walk in the room. With styles continuously coming and going with the years, we decided it would be a great opportunity to write a guide of trends to look out for in 2019! Whether you are building a brand-new house, renovating your current or just sprucing up the area a pop of colour is what everyone is leaning towards for 2019 – this is the year to be bright, bold and adventurous! Although having white in your kitchen is still very popular to be creating an open and clean feeling kitchen. But 2019 is going to see bits of colour popping up in white kitchens whether you incorporate this through a beautifully colour splashback or even get creative and buy some coloured cooking utensils/appliances! Paint an island or accent wall – the options go on and on. 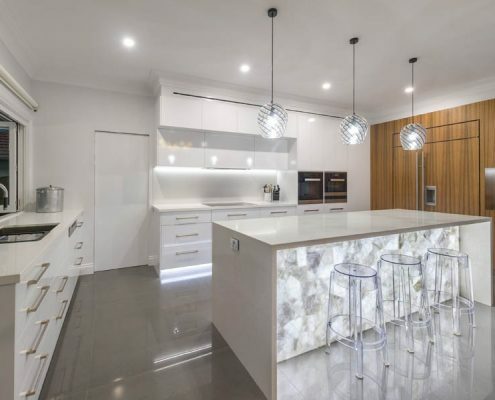 Let’s talk about Quartz – we all dream on having a stunning Quartz piece in our homes, but this is the year to take the plunge and go for it, 2019 is all about statements and this just ticks every box. Not only is it easy on the eye but the durability is phenomenal, easy to maintain and a more affordable option opposed to granite. Being 2019 and all, we want to go the extra, modern mile and this may mean no handles is the way to go! No, seriously – say goodbye to handles because push-touch is your new best friend, if you prefer to have cut-outs, they are still very stylish and all in for this year’s trend. 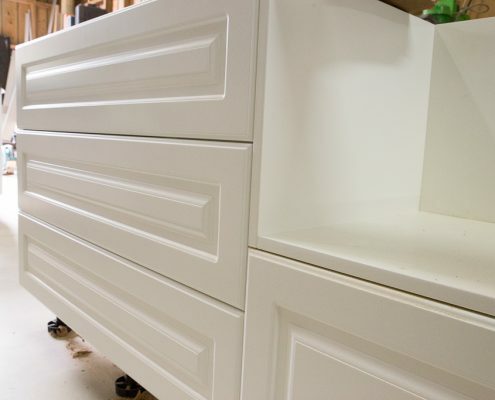 Or opt for indents along the base of the cabinet door to keep the indents tucked away and out of sight. Open shelving has been around for a few years as a way to showcase your attractive dishes. 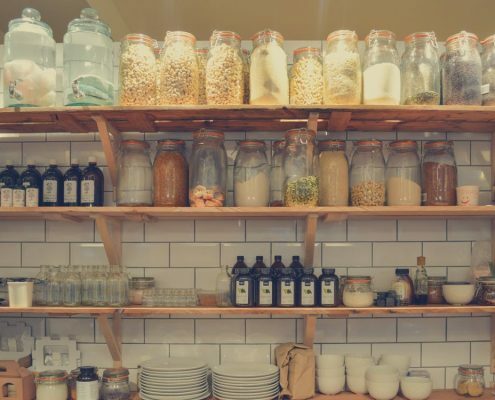 We all love open shelving because of the modern, classic look it gives the room – this is among many different Kitchen designers lists for trends in 2019 and to be fair – we can’t argue otherwise, it’s a great idea to make your kitchen space to appear bigger than it is. Goodbye Gloss and hello Matte! Matte is such a great aspect to include in the kitchen it just blends ever so smoothly and looks exquisite. There is a bonus here which is that matte is more forgiving with showing fingerprint markings as easily as gloss can. We also predict these will be around in the trends for many more years to come. Wait, what? 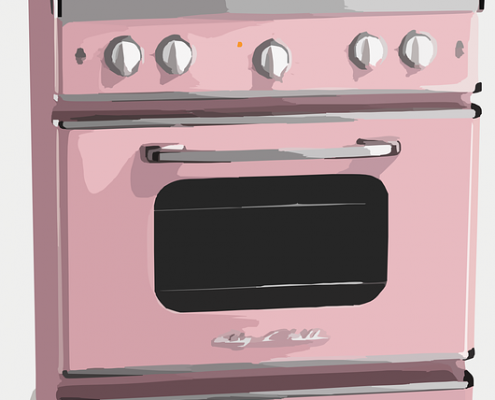 Stoves and rangehoods in….colour?? Yes, that’s right – this goes back to reason #1 as to why we are adding colourful options to the list of trends for 2019 – it is such a fun way to brighten up your style whilst adding a wonderful statement piece. 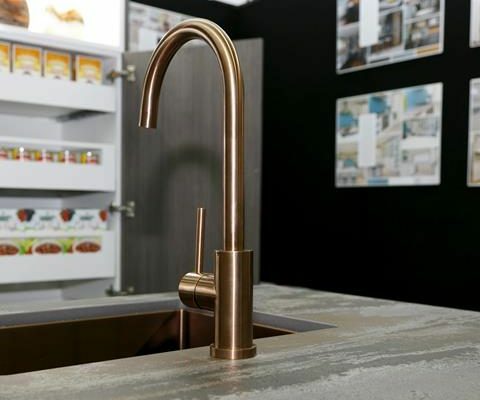 Gold or copper are dashing their way into 2019 with a great deal of attention, these colours work well in most kitchens whether you have dark or light benchtops, do use these in small doses – we recommend handles or sinks/tapware! 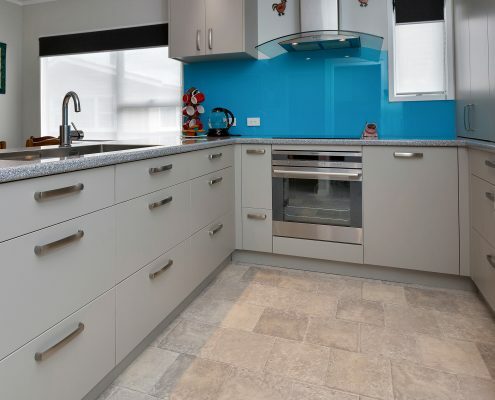 Funky coloured/texured Splashbacks are all in for 2019, the wonderful patterns these have to choose from is absolutely tempting and would compliment a wonderful kitchen, could this be your statement piece? Thanks for reading, let us know what you’d like to see in the next blogs!